W.A. Dwiggins has held an anomalous position within design history. His varied work as an advertising designer, book designer, and type designer is often praised but rarely shown in design history surveys. Instead, he is included principally as the coiner of the phrase “graphic design.” It is an assertion that I debunked several years ago, though it still persists. The source of the claim is the term’s appearance (once) in “New Kind of Printing Calls for New Design,” an article that Dwiggins wrote for the special Graphic Arts Section of the Boston Evening Transcript (August 29, 1922). His text* has since been reproduced in toto in The Origins of Graphic Design in America, 1870–1920 by Ellen Mazur Thomson (New Haven and London: Yale University Press, 1997), Appendix B, pp. 184–189; and in the anthology Looking Closer 3: Classic Writings on Graphic Design edited by Michael Bierut, Jessica Helfand, and Steven Heller (New York: Allworth Press, 1999), pp. 14–18. 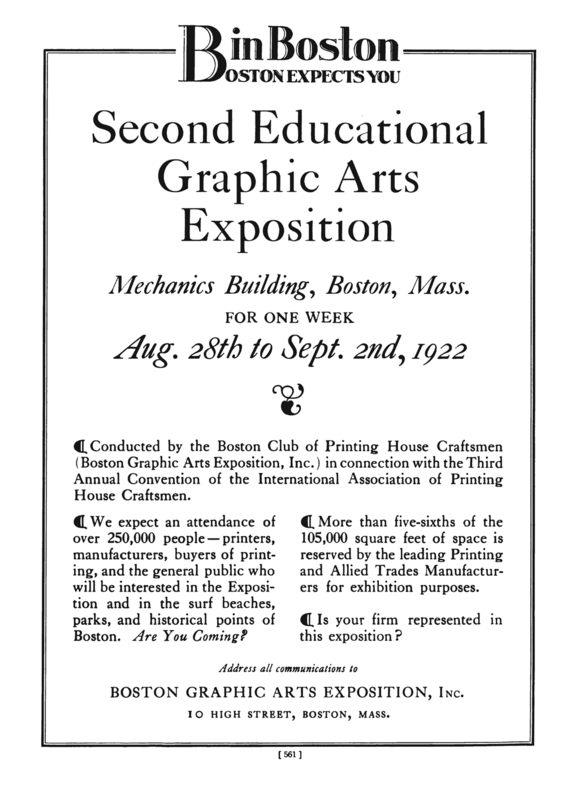 “B in Boston” advertisement for the Second Educational Graphic Arts Exposition in The Printing Art vol. XXXIX, no. 6 (August 1922). Step in, folks, and be surprised. Here you will find the greatest show of its kind ever brought together under one roof. A monstrous, marvelous, magnificent demonstration comprised of forty-seven aggregated industries, not to mention thirty-six congresses of fierce, ferocious and untamed delegates numbering, my friends, a quahtah of a million! Walk right in and see the only living specimen of a complete box-making plant away from its native lair! See the famous pygmy paper-making machine and the transplanted engraving plant! Here also we have a herd of monstrous presses doing a whirling dervish—hear ’em roar—and over here the ferocious flocks of composition marvels, which eat red hot lead and spit out slugs and such. Going up! Now on this floor we have the printing exhibit and you can whisper to the fair young world that it is the greatest display of its kind ever brought together anywhere anytime. While here, be sure to visit Booth 744, where you will find in specially constructed cages a part of the staff of that great moulder of printing opinion, The American Printer. Here also you will see many other rare and unusual curiosities, including a book of stone, hand-carved by a Sioux Indian, a newspaper printed on a shingle and others on leaves. Please take off your hats, for here is a page from the original Gutenberg Bible, done about 1450, and very likely the first book ever printed. Now we come to the famous Nuremberg chronicle, the book printed by Anthony Koberger of Nuremberg in 1494, in which we find the same wood cut portraits used for several persons and a landscape engraving shamelessly shown for more than one city. Then there is the Tom Thumb of the lot, a copy of the smallest book in the world, a book so small that it can not be read without a magnifying glass. If it ever dropped on the floor a vacuum cleaner would be required to find it. Those interested in entomology will be pleased to examine the finest collection of worm holes in captivity, as found in this work by Pere Grinum de Pasqualibus of Venice. The volume was done in 1485, during the first forty years of the craft, and it shows what a real bookworm can do when he puts his mind to a thing. View of one of the machinery departments at the Graphic Arts Exposition. From The American Printer (September 20, 1922), p. 58. It is very likely that Dwiggins’ participation in the planning of the Honor Hall exhibition spurred him to write “New Kind of Printing Calls for New Design,” though it is also possible that several articles published in the run-up to the convention may have influenced him as well. Throughout 1922 Robert Ruxton and Fred T. Singleton, in their respective columns “Selling by the Printed Word” and “The Designing Board” in The Printing Art, constantly debated the role that art played in advertising; and In The Craftsmen Number of The American Printer Frederic W. Goudy contributed an essay entitled “Design and Beauty in Printing.” Ruxton, in his January 1922 column, concluded that “Art, in advertising, is an excellent servant, but a bad master.”  The tangled topic of the relationship among art, printing and advertising was in the air. At the time that Dwiggins wrote “New Kind of Printing Calls for New Design” he was in the midst of a personal crisis occasioned by the diagnosis that he had adult-onset diabetes. Although the discovery of insulin the year before meant that the disease was no longer fatal, the diagnosis pushed Dwiggins to seek a break from advertising design with the hope of devoting his energies to book design. The article for the Boston Evening Transcript was one outgrowth of deep thinking about how to best use his talents as an artist. Most of his thoughts on the matter were private, shared only with his close friends Carl Purington Rollins and Rudolph Ruzicka. But his dissatisfaction with aspects of advertising art were not new as they went back at least as far as 1914 when, in the guise of his alter ego Hermann Püterschein, he wrote “Drawings that Sell Goods” for The Printing Art. The publication of “New Kind of Printing Calls for New Design” was part of Dwiggins’ increasing self-confidence as a commentator on aspects of his profession. He was no longer hiding behind the mask of Hermann Püterschein, though he still continued to use his alter ego for more personal texts. 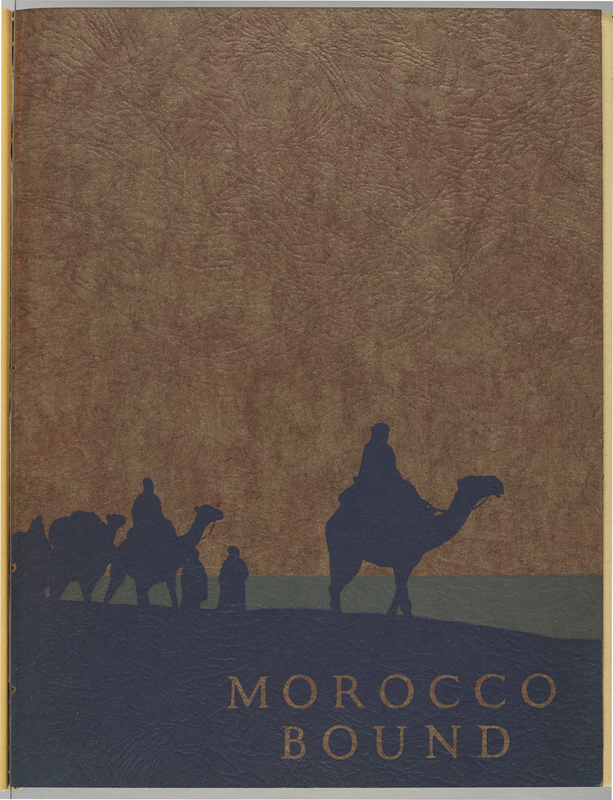 “Morocco Bound” advertising insert for Knowlton Brothers in Direct Advertising, vol.IX, no. 1 (1922). Design by W.A. Dwiggins. 1. See my posts dated June 4, 2014 and June 8, 2014; and The Definitive Dwiggins no. 81. The most recent example of the persistence of the notion that Dwiggins invented the term “graphic design” is in the publicity for the forthcoming Dwiggins biography by Bruce Kennett. 2. Heller gets both the date of Dwiggins’ death wrong and the nature of the event that precipitated the publication of his essay. Dwiggins died in 1956, not 1957. The essay was not “…published in conjunction with the city’s annual graphic arts exposition” (italics added), but in conjunction with the Second Annual Graphic Arts Exposition sponsored by the International Clubs of Printing House Craftsmen. The first exposition had been held the previous year in Chicago. 3. Here are a few instances of the wide variety of interpretation of the terms that Heller cites in sources published between 1900 and 1920. In “Advertising” by A.M. Stryker in Business Administration: Theory, Practice and Application edited by Walter D. Moody and Samuel MacClintock (Chicago: La Salle Extension University, 1911), advertising art is described as a branch of commercial art: “There is a certain distinction between commercial art and advertising art that will be better appreciated when learned through experience. The production of commercial art is, the greater part, mechanical. It calls for little originality, but much skill in mechanical draughtsmanship. It is not art in the true sense of that term.… The work of the advertising artist calls for an entirely different skill, ability and training. The advertising artist must originate and design—he must catch the ‘Advertising Idea’—he must have poetry of imagination in his soul and be able to make it compatible with merchandising.” p. 109. “Commercialism in Art” by Hugh Stuart Campbell in Sketch Book: A Monthly Magazine for Students by Students [Art Institute of Chicago] July 1903, p. 38 described several levels of commercial art, with the highest being “book covers, headings and poster decorations.” Francis William Vreeland, in his column “Commercial Art” in The American Printer vol. 44, no. 5 (July 1907), p. 554 listed the outlets for commercial art as printers, publisher and advertisers. Printing in Relation to Graphic Art by George French (Cleveland: The Imperial Press, 1903) defined graphic art as art for book printing. American Graphic Art by Frank Weitenkampf (New York: Henry Holt and Company, 1912) took an art historical approach in which graphic art was a reproductive art. His book was a survey of woodcuts, engravings, etchings, aquatints and lithographs with a chapter on applied graphic art that is devoted almost entirely to a survey of posters and poster artists. “Advertising design”, as commonly used in the pages of Advertising & Selling, refers not to art per se but to layout, typography and ornament. “Printing art” is about the quality of craftsmanship in printing. For example: “Many jobs that are attractive at first sight, and seem to be gems of printing art, prove, on close examination, to be so full of little imperfections that one is disgusted with the printer who will perpetrate such a deceit and the public that will stand for it.” from “Department of Business Administration” by Daniel Baker in The Printing Art vol. XXXI, no. 2 (April 1918), p. 142. 4. The First International Annual Convention of the Printing Craftsmen’s Clubs was held in Washington, DC in 1920. 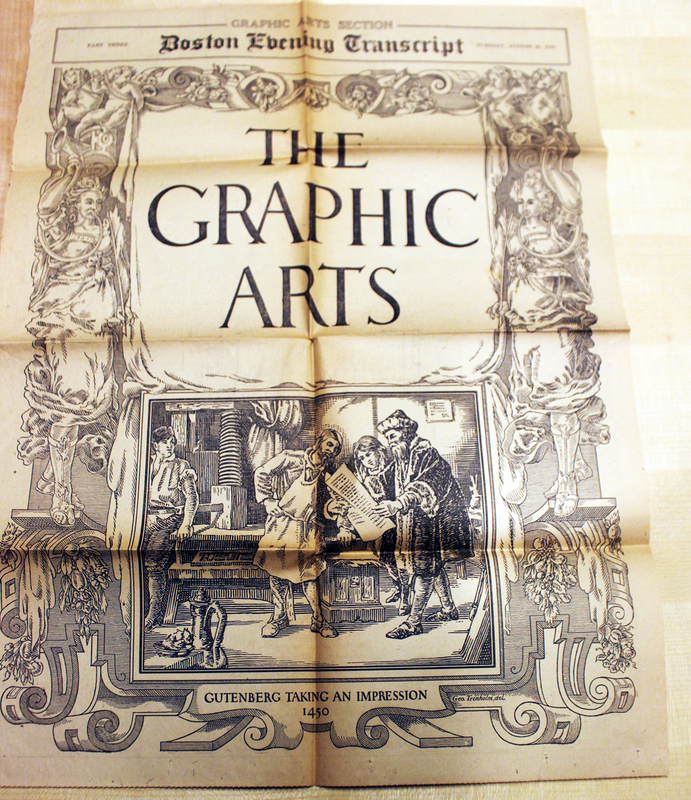 The second in Chicago 1921 included the First Educational Graphic Arts Exposition. 5. “So this is Boston” by Earl H. Emmons in The Craftsmen Number of The American Printer vol. 75, no. 4 (August 20, 1922), p. 46. The Mechanics Building is more familiarly known as Mechanics Hall. The building was a 12-minute walk from the Fenway Studios where Dwiggins had moved his workplace a little over three months earlier. 6. The work was selected by a jury “made up of men of wide experience in various branches of the graphic arts, particularly in printing for commercial and advertising purposes.” Its members were Carl Purington Rollins (Yale University Press), William Edwin Rudge (The Printing House of William Edwin Rudge), Harry L. Gage (Bartlett-Orr Press), George Adomeit (The Caxton Company), and Allen Collier (The Proctor & Collier Co.). A copy of the broadside announcing the Honor Hall competition is in the Graphic Arts Exposition Folder, Richard C. Jenkinson Collection, Special Collections Division, Newark Public Library. 7. “Selling by the Printed Word” in The Printing Art, vol. XXXVIII, no. 5 (January 1922), p. 453. 8. Exactly when Dwiggins was diagnosed with diabetes is unclear, other than that it was sometime in 1922. Based on an examination of both his account books and his correspondence with Carl Purington Rollins, I believe he began to feel the effects of the disease in February of that year and that the diagnosis was made by mid-April. 9. “Thus, in 1922 a deteriorating state of health was diagnosed as diabetes…. the knowledge that he had a potentially fatal malady profoundly affected his life. He resolved to devote himself to the things that he wanted to do with a minimum of the old commercial work.” Dorothy Abbe, typescript biography of Dwiggins for a 1972 talk to the Bookbuilders of Boston, Folder 181, Box 31, 2001 W.A. Dwiggins Collection, Boston Public Library. Although Abbe, in her many writings and talks on Dwiggins, has suggested that Dwiggins made an immediate switch from advertising to book design in 1922/1923, his account books tell a different story. Those years were among his busiest as an advertising designer and it was not until 1928 that book design became a significant part of his career. Furthermore, he continued to rely on commercial work through 1936. 10. The first article by Dwiggins under his own name on a professional topic was “Some Why’s and Wherefore’s of the Shapes of Roman Letters” in Direct Advertising, vol. VI, no. 3 (1919), pp. 5–8 and 31–31. 11. At least four of these paper companies, along with many other Dwiggins’ clients, took part in the Second Educational Graphic Arts Exposition. See the list of highlighted exhibitors—out of over 200—in The Inland Printer, vol. 70, no. 1 (October 1922), pp. 102–110. Make a record of these two facts—printing is not an art, and art is not essential to printing—and against them as a background let us project the following surprising conclusions. The history of printing is largely a history of individual artists. The names that stand foremost in the biography of the craft are the names of men conspicuous for a fine taste for design. Out of all the mass of printing that must have been done since the invention the only noteworthy relics are those few books and documents that were made by men of artistic mind. Printed paper has been collected and cherished for three hundred years, not because it was printing but because it was printed art. Artists have tampered with printing and diverted it to their own ends ever since Gutenberg devised movable types. All through the course of the industry they have brought their faculties to bear upon the problem of turning printing into fine art. They have tampered with it in such a thoroughgoing fashion that—so far as the old work is concerned—the practical reasons for doing printing have been lost sight of, and printed paper is noteworthy chiefly because artists did meddle with it. It will be perceived at once by the most complex that here are two groups of facts that do not fit together at all. There is more to this matter than appears at first blush. It would seem that there are several distinct classes of things to be examined under the title “printing.” There are, verily. Let us get down to cases and pick the industry apart. We want to find out what art has to do with printing—not historic printing but printing here and now. There are plain lines of cleavage in the modern industry. Working on these we are able to pry the business apart into three rough classes—plain printing; printing as a fine art; and a third large intermediate class of printing more or less modified by artistic taste. Town reports and handbills, telephone directories and school catalogs stand in the first class. The second might be represented by books printed for the Grolier Club by Bruce Rogers. The third class of printing is so wide and so varied that you will have trouble choosing examples to represent it. Printing of the first class—the plain variety—is the backbone of the industry. This class out bulks the others by an overwhelming tonnage. It performs an imposing and valuable work and performs it in a thoroughly workmanlike manner. The technical excellence of the product of the “plain” printing plant is all that anyone could ask. The class of printing proves the truth of the deduction of the third paragraph. It gets no help from art and does not need it. It is outside the domain of art. But the consideration of printing as fine art is not quite the purpose of this note. Printing on that plane is, by its very nature, removed from the province of a critic of the fine arts, and cannot be examined on an equal footing with the product of the industry at large. What contact the industry at large has with art is the question on which we are engaged. We have narrowed our examination down to the third group of printing. We may look for that contact there. This last group has certain noteworthy characteristics. For one thing it is not made to be sold, it is made to be given away—with a very canny purpose behind the gift. Then, it is a new thing—as new as advertising. It is thoroughly democratic—everybody takes a hand in making it. It goes everywhere and is read by everyone. It probably plays a larger part in forming the quasi-social state that we call civilization than all the books and newspapers and periodicals together. Its function is to prepare the ground for selling something, or to sell something directly itself. By hook or by crook, by loud noise or subtle argument, it might fulfill its mission of getting something sold. The art department produces something. It is what is called “art work.” The expression “art work” is advertising agents’ slang. “Art work” might be defined as drawings, decorations, etc., made to complicate the advertiser’s message. It seems that in some advertising a plain straightforward statement of the facts will not serve. Little indiscretions must be committed. Little naive slips and false starts need to be contrived, to catch the victim’s eye. Or he must have his back rubbed and his foibles exploited before he can be coaxed into just the right position for the deadfall to get him. One infers that it is the function of the art service to provide these inducements, indirections and subterfuges. The ingenues of the art services work most skillfully at making pictures and ornamental designs. Their products rank sufficiently high as drawings and designs. But the application of their work slips up in some peculiar way. The big carnival on Main Street needs their help to be a complete affair but their art is off up a side alley doing clever tricks. The implication is that the advertising artists fail to set the proper tone. The conduct of an art as an adjunct to business is always difficult. These artists, however, sound as artists they may be in themselves, are under a pressure from outside that is almost bound to make them unfit as exponents of sound standards. It is unlucky that the job of setting styles for printing should be in their hands, because they are bound by the conditions of their service to set styles on a level lower than the best. Cultivate simplicity. Have simple styles of letters and simple arrangements. In the matter of layout forget art at the start and use horse-sense. The printing-designer’s whole duty is to make a clear presentation of the message—to give it every advantage of arrangement—to get the important statements forward and the minor parts placed so that they will not be overlooked. This calls for an exercise of common sense and a faculty for analysis rather than for art. Have pictures consistent with the printing process. Printers’ ink and paper are a convention for light and shade and color. Stay inside the convention. Be niggardly with decorations, borders and such accessories. Do not pile up ornament like flowers at a funeral. Scheme the white spaces—paper is indeed “a part of the picture.”  Manipulate the spaces of blank paper around and among the printed surfaces to make a pleasing pattern of areas. It is easy to formulate rules. It is not so easy to apply them. As a matter of fact, the new kind of printing calls for a new kind of design. The revolution in technical practice is complete. Very little is left of the old methods. The standards of good printing as they stood from the beginning of the craft are suddenly superseded. There is thrust into the printer’s hand a complex of new processes—halftone engraving, machine composition, quadricolor, offset, fast running photogravure. The original conception of sound printing design as it stood until the age of the machines has very little bearing on these new processes. The impression of ink upon paper is an entirely new and different thing. In one generation of printers the continuity of tradition has “faulted.” Can we design this new printing with our minds trained in the standards that guided Aldus, or Bodoni, or DeVinne? Must all these things that we looked upon as good go overboard? How much of the old standard of quality can carry across the gap, and how can it be related to the new state of things? Typesetting by hand is about to become as obsolete as spinning thread by hand. Machine composition is a settled fact. How is it to be made good in the old sense? Or is the old sense to be discarded? 1. Printed in Boston Evening Transcript (August 29, 1922), Graphic Arts Section, pp. 3–6. movement. It was also the name of a leading printing trade journal in the United States from 1903 until 1925. The Printing Art was founded by Henry Lewis Johnson (1867–1937) who hired Dwiggins to do work for the magazine and also promoted him in it. 3. The confusion that Dwiggins cites was an outgrowth of the Arts & Crafts movement and the work of William Morris at the Kelmscott Press. Attempts to emulate his efforts in England and the United States led to a fine printing movement whose practitioners and adherents considered printing as an art. For instance see “The Literature of Typography XXVI—Great Britain” by Henry Lewis Bullen in The Inland Printer, vol. 55, no. 1 (April 1915), pp. 61-62. Of Morris, the Boston-based Society of Printers said, “His types, designed and cut especially for his books, together with the illustrations and decorations, designed by and for him, the hand-made paper which he adopted, and the hand presswork by which the books were executed taught certain lessons of harmony and unity to printers which are, perhaps, his most valuable contribution to printing as an art.” The Development of Printing as an Art: A Handbook of the Exhibition in Honor of the Bi-Centenary of Franklin’s Birth (Boston: Society of Printers, 1906), p. 20. The handbook accompanied an exhibition by the Society of Printers which, surprisingly, included commercial printing, though little of it was advertising. Also see “The Art of the Book in America” by William Dana Orcutt in The Art of the Book: A Review of Some Recent European and American Work in Typography, Page Decoration & Binding edited by Charles Holme (London, Paris and New York: “The Studio”, Ltd., 1914), pp. 259–276. The phrase “printing as an art” originally meant printing as a high skill but it quickly came to be interpreted by many as equating printing with the fine arts. 4. This was the attitude that Robert Ruxton took in several of his “Selling by the Printed Word” columns for The Printing Art in 1921 and 1922. E.g. “The great fact is that business is not sustained by art but sustains art (a very literal fact in a great deal of advertising). Art is not the structure of civilization, but the ornament of civilization. Art is not a necessity, but a luxury.… In business, and in advertising, the necessity of sales comes before the necessity for art.…” From “Selling by the Printed Word” in The Printing Art, vol. XXXVIII, no. 5 (January 1922), p. 449. 5. Dwiggins wrote his essay three months after the publication of Printing Types: Their History, Forms, and Use: A Study in Survivals by Daniel Berkeley Updike (Cambridge, Massachusetts: Harvard University Press, 1922), but several year before a spate of books on the history of printing and the history of the book came out. Among them Four Centuries of Fine Printing by Stanley Morison (London: Ernest Benn, 1924); The Art of the Printer by Stanley Morison (New York: Simon & Schuster, 1926); The Kingdom of Books by William Dana Orcutt (Boston: Little, Brown & Company, 1927); The Golden Book: The Story of Fine Books and Bookmaking by Douglas C. McMurtrie (New York: Pascal Covici Publishing, Inc., 1927); A History of Printing: Its Development through Five Hundred Years by John Clyde Oswald (New York: Appleton and Company, 1928). His notion of the history of printing as a history of individuals seems to be derived from Updike’s book. 6. One of the most important insights in Dwiggins’ essay is his recognition of a cleavage within the printing industry. There were actually two interrelated fault lines. The first was between those who saw printing as an art and those who viewed it as an industry. The first group focused on the printing of books and waxed rhapsodic about hand composition, historically-inspired typefaces and ornament, and handmade paper. The second group looked at printing through a wider lens that took in the printing of ephemera and periodicals as well as books. It not only embraced the machine and mechanical processes, but it promoted efforts to organize the printing plant in line with the contemporary efficiency and uniform cost accounting movements. Straddling these two positions was the Harvard University Course in Printing that ran from 1911 to 1922. For details see “A West Point for Printers” by Max Hall in Harvard Business School Bulletin, vol. 55, no. 1 (January/February 1979), pp. 12-16. The second fault line was within this second group. While many wanted printers to stick to printing, there was an increasingly vocal faction that, aware of the encroachment of the advertising industry, urged printers to add direct advertising services to their repertoire. One of the leaders of the direct advertising movement was Brad Stephens (1878–1964), Dwiggins’ principal client between 1913 and 1927. 7. Bruce Rogers (1870–1957), considered by contemporaries to be the leading book designer in the United States, had designed two books for the Grolier Club, a New York bibliophile organization founded in 1884, in the previous decade: Franklin and His Press at Passy by Luther Samuel Livingston (1914), Of the Just Shaping of Letters by Albrecht Dürer (1917). He designed three other books for the club between 1923 and 1933. 8. Although Dwiggins did not name names, among those he probably had in mind as examples of “printer-artists” were Daniel Berkeley Updike (1860–1941), Bruce Rogers, Thomas Bird Mosher (1852–1923), and John Henry Nash (1871–1943). His essay was published too soon for Elmer Adler (1884–1962), Porter Garnett (1871–1951) or Edwin and Robert Grabhorn to have been considered. For a broad look at fine printing in the United States see The Beauty and the Book: Fine Editions and Cultural Distinction in America by Megan Benton (New Haven and London: Yale University Press, 2000). 9. Dwiggins is describing the push during the 1910s by Brad Stephens and others to convince printers to see themselves as producers of direct advertising. To do so, they were urged to add new capabilities to that of printing, most notably copywriting and art services. The trade magazines reflected this trend by adding special departments to chronicle it. In September 1914 The Printing Art added a “Department of Printed Salesmanship,” initially overseen by Thomas Dreier and, after June 1917, by Robert Seaver; and in November 1921 The Inland Printer introduced a “Direct Advertising” column by Robert E. Ramsey. In 1919 the United Typothetae of America ran a campaign encouraging printers to take advantage of the profits offered by engaging in direct advertising. See The American Printer, vol. 69, no. 5 (September 5, 1919), pp. 44–46. 10. Dwiggins’ explanation of “artwork” in art departments is not wholly accurate. Artwork was often used to describe the mechanical reproduction of original art as either photoengraved plates or elements (e.g. galley proofs, photostats, etc.) intended for assembly in a paste-up. 11. The trend toward adding art departments to large printing concerns was chronicled in “Commercial Art Department for the Printery” by Robert F. Saladé in The Inland Printer, vol. 62, no. 2 (November 1918), pp. 211–212. 12. All three of the illustrators that Dwiggins cites are considered to be leading figures of the Golden Era of American Illustrator. (One source describes Raleigh as the most financially successful commercial illustrator of his time—before going bankrupt in the 1940s.) Coles Phillips (1880–1927) was “one of the first artists whose images of ladies were frequently torn out of magazines and swiped out of store windows to become pin-ups on college dormitory walls.” His illustrations were principally for magazine covers and advertisements. Henry Patrick Raleigh (1880–1944) and George Hand Wright (1872–1951) were known more for illustrations of books and magazines stories. Dwiggins’ suggestion that Phillips was more popular than either Raleigh or Wright—a claim which historians of illustration might contest—because his illustrations were done for advertisements reveals his own bias towards book illustration as well as his increasing antipathy toward advertising. 13. I believe that Dwiggins’ use of “graphic design” instead of “graphic art” was either just an attempt to vary his writing or an inadvertent slip of the pen. He does not follow up its appearance with any elaboration of how it differs from other terms used in the essay. 14. Dwiggins’ sudden reference to typographers is strange coming after his comments about illustrators Phillips, Raleigh, and Wright. His moral code is reminiscent of the long-winded tenets set forth a year earlier by Fred T. Singleton in “Design: The Missing Link between Copy and Printing” in The Printing Art vol. 36, no. 6 (February 1921), pp. 483–490. Singleton advocated good proportions of paper, legible type, accurate and appropriate illustrations, simplicity in decoration, unpretentious paper, and quality presswork and binding. 15. The phrase “paper is part of the picture” comes from Strathmore Paper Co.’s contemporaneous advertising campaign, of which Dwiggins was a part. In August 1922 he was working on his contribution which was not issued until the following year. The admonition against too much decoration is a response to the vogue for borders and frames that dominated American advertising at the time, and especially against the influential work of T.M. Cleland (1880–1964) and Walter Dorwin Teague (1883–1960). Although Dwiggins himself was a contributor to the trend for decoration, it should be noted that his essay was written at the same time that he was engaged in experiments with wooden stamps to create a new method and style of ornament. See Stencilled Ornament & Illustration by Dorothy Abbe (Hingham, Massachusetts: Püterschein-Hingham, 1979), pp. 3–6 and Bulletin No. 2, Transactions of The Society of Calligraphers (February 3, 1925). 16. Dwiggins does not say what his criteria for a good typeface are, but they can be gleaned from his earlier article “Some Why’s and Wherefore’s of the Shapes of Roman Letters” in Direct Advertising, vol. IX, no. 3 (1919), pp. 5–8, 31–32. “A type face is good if it is easy to read. No concession that interferes with ease of reading may be made either to beauty of appearance or to mechanical felicity. Legibility is the basic law, the sine qua non.” The typeface that he rated the highest then was Caslon no. 471. He praised it for being natural, simple, and having good color. It “more nearly than any other type satisfies the designer as an all-round letter for all purposes,” he explained. Caslon no. 471 was followed by Scotch, Bookman, Monotype Caslon no. 337, Bodoni, and Century as rating 75% or better on his scale. 17. To these new processes, Dwiggins could have added photoengravings, Benday tints, and photostats. He could also have noted how the methods of print production had changed with the introduction of layouts, dummies, and mechanicals; and that a more rational approach to the use of color was underway with the publication, the year before, of A Grammar of Color which introduced the Munsell Color System to the printing industry. The book was on display at the Second Educational Graphic Arts Exposition. 18. Dwiggins’ trio of printers whose standards needed to be rethought is interesting. Aldus Manutius (1449–1515) represented the Renaissance book, Giambattista Bodoni (1740–1813), defined Neoclassical printing, and Theodore Low De Vinne (1828–1914), personified practical 19th century printing. These choices were also a pointed indication that the standards of William Morris and the Arts & Crafts era no longer had a place in printing. 19. Dwiggins’ acceptance of machine composition was more than an acknowledgment of reality. In his subsequent career as a book designer he constantly opted for machine composition over hand composition. And he deliberately chose to work with Mergenthaler Linotype rather than American Type Founders when he became a type designer at the end of the 1920s. 20. Throughout his career Dwiggins tried to maintain a sense of the human in his design work, even while accepting modern machine methods and techniques. Expressions of this deep-felt view can be found in a number of his writings from “Standardized Art, a Movement Toward Quantity Production” in Direct Advertising vol. VII, no. 1 (1921) to “Comment by W.A.D. on a New Linotype Face” in Emblems and Electra (Brooklyn: Mergenthaler Linotype Company, 1935) to Millennium I (New York: Alfred A. Knopf, 1945). 21. Dwiggins’ choice of artists is even more intriguing than his choice of printers. Hans Holbein the Younger (c.1497–1543) was known for his portraits while Geoffroy Tory (c.1480–1533) was renowned as a polymath. Both made contributions to book design, Holbein with his illustrations for the Basel printer Johann Froben and the title page of Martin Luther’s Bible; and Tory for his various Books of Hours (1525–1531) and his Champ Fleury (1529). Dwiggins was most likely drawn to the multi-skilled Tory as a reflection of himself. 22. A sly, but deliberate reference to the designs of Cleland and Teague, especially the latter’s work for Adler-Rochester Clothes which was then at its zenith of complexity and of public acclaim. “Pages in color and black and white [sic] done for Community Plate and Adler Rochester Clothes [sic] are more beautiful and interesting than the covers or text pages of the high-class magazines which contain them,” wrote W.A. Kittredge. See “Walter Dorwin Teague: Master of Typographic Design” by W.A. Kittredge in The American Printer, vol. 73, no. 6 (September 30, 1921), p. 32. For examples, albeit small and in black-and-white, see nos. 215, 248, 251 in the Annual of Advertising Art in the United States 1921 (New York: Publishers Printing Company for The Art Directors Club, 1921). Also, see the display card at the bottom of this post. 23. Dwiggins’ warning against using the decorative ideas of the “ancients” as a source of inspiration was not only a swipe at designers like Cleland and Teague, but also against commentators like Singleton. Throughout 1922, Singleton’s monthly column “The Designing Board” in The Printing Art was devoted to tracing the history of Pompeian ornament. At the same time, most of them included a sidebar on the “great ornamentalists” (Jean LePautre, Giovanni Battista Piranesi, Daniel Mabot, Giuliano da Sangallo, Jean Berain, Nicoletto da Modena, Sebastiano Serlio, and Sebastien LeClerc). 24. Although Dwiggins does not name the French artists he admires, it is likely that he was thinking of George Barbier (1882–1932), Paul Iribe (1883–1935), Georges Lepape (1887–1971), and Charles Martin (1884–1934), who were known in the United States as well as France for their fashion illustrations and magazine covers. Together they are seen as pioneers of the new style of illustration now known as Art Deco. Their work influenced Dwiggins’ shift toward a more Art Deco style of illustration in the 1920s. 25. Heyworth Campbell (1886–1953) was the art director of the Condé Nast publications Vogue, Vanity Fair, and House & Garden in 1922. He was a founding member of the Art Directors Club and its first president from 1920 to 1922. 26. Dwiggins’ middle-of-the-road conclusion was typical of his views and his work. He found himself constantly caught between respect for the past and a desire to escape it. The constant tug-of-war between these impulses is what makes his work so fascinating. Despite its prolixity and stiltedness, this definition was certainly clearer than any Dwiggins offered in “New Printing Calls for New Kind of Design.” Singleton’s essay was a plea for the recognition of a new profession, that of the “designer-salesman” who would replace the “printer-businessman” in handling the design of printing, and thus guarantee it would not be shoddy. To achieve this end, his designer-salesman was expected to be blessed with a wealth of skills: familiarity with proportions such as the Golden Section, knowledge of historical decorative styles, a command of diverse illustration techniques, an understanding of the various engraving processes, and experience with the printing business from typesetting to binding. 2. For a broad overview of this phenomenon see Artists, Advertising, and the Borders of Art by Michele H. Bogart (Chicago and London: University of Chicago Press, 1995). 3. “Art, if You Wish, but Not Advertising” by Fred T. Singleton in The Printing Art, vol. 37, no. 3 (May 1921), p. 245. 4. Dwiggins’ portrait of Franklin was reused for a Tileston & Hollingsworth Co. insert in Direct Advertising vol. VIII, no. 1 (1921) as well as for the Franklin Bi-Centennial Number of The American Printer, vol. 76, no. 3 (January 20, 1923). 5. “Design: The Missing Link between Copy and Printing” by Fred T. Singleton in The Printing Art vol. 36, no. 6 (February 1921), pp. 483–484. Singleton subsequently printed his article as a stand-alone pamphlet. 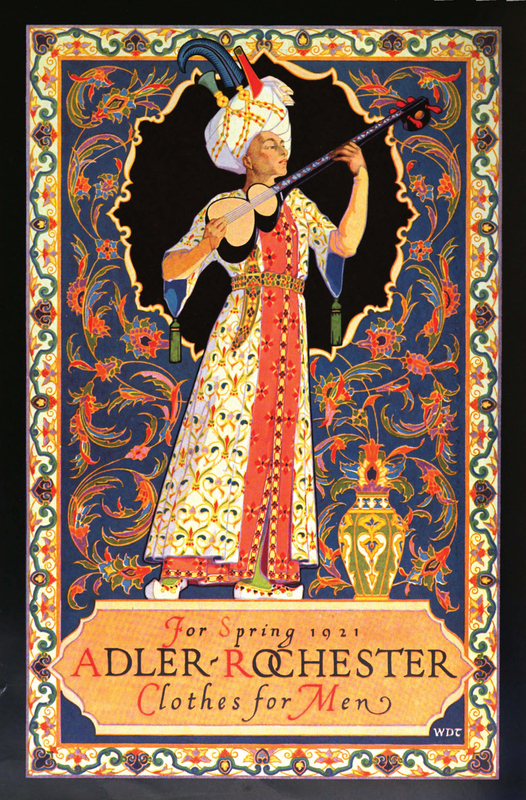 Display card for Adler-Rochester Clothes for Men (1921). Design by Walter Dorwin Teague.